This year’s Welcome to the Future Festival will take place on July 22nd, 2017. For the eleventh year in a row, Het Twiske’s mesmerising nature reserve––just outside of Amsterdam––will host one of the Dutch summer’s most extraordinary house & techno events. Headliners include Loco Dice, Chris Liebing, Seth Troxler, Dave Clarke and Damian Lazarus. “This is the future, and everyone’s invited!” Welcome to the Future founder Gert van Veen explains the vision he had for his very first parties in 1991, when house and techno had only just reached the European mainland. 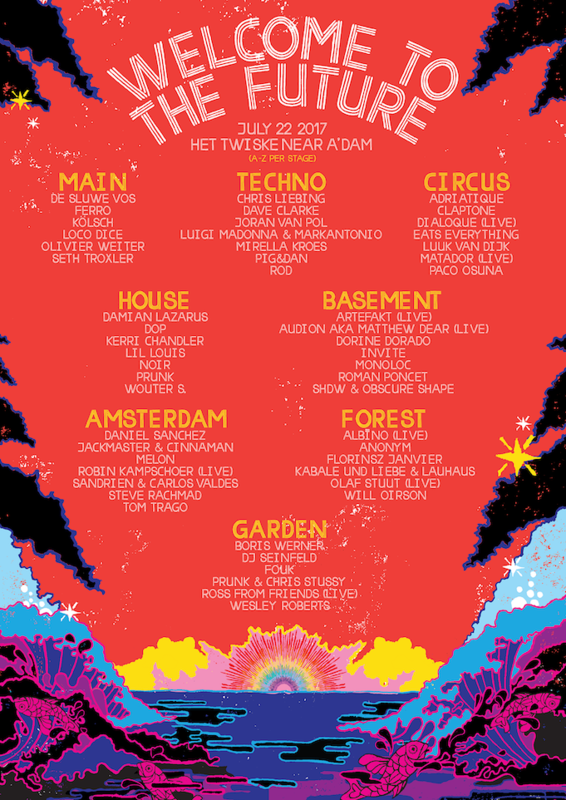 A lot has changed since then: electronic music culture has become a worldwide phenomenon, and Welcome to the Future Festival has blossomed into one of Holland’s most popular festivals. But this original vision of inclusiveness and innovation has always stayed at its core. A festival is nothing without the people, they are part of the artwork. It’s what the Germans call a Gesamtkunstwerk. This comprehensive approach makes Welcome to the Future Festival feel more like a family gathering––of both the artists and their dedicated crowd. Uniting on the dancefloor, they exemplify a movement, that cherishes values like positivity, togetherness and freedom of expression. Welcome to the Future family members include some of house and techno’s most relevant DJs and live-acts. Household names like Loco Dice, Chris Liebing, Seth Troxler, Dave Clarke, Kölsch, Damian Lazarus, Kerri Chandler and Lil Louis are among those headlining the eight stages. And, as always, the Dutch scene is strongly represented, with names like Tom Trago, Steve Rachmad, ROD, De Sluwe Vos, Joran van Pol and Wouter S.
Not to mention all the other amazing talent taking to the stage. And sustainability, of course. With its leave no trace philosophy, organic food and free water bars, Welcome to the Future is in the top ten greenest festivals in the world.